one cannot skip the bad parts. 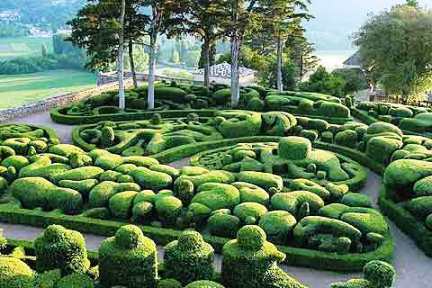 These natty hedges in the Gardens of Marqueyssac would require serious maintenance — maybe like Prince Charles' haircut; reportedly a trim every week. Gardeners love to share, advise, and are eager to learn. Need help? The Gardening FAQ section is the place where the earthy, beautiful people hang out... raring to grow. I enjoy hearing from my readers and so do all the thousands of gardeners who follow this website! Here are a few questions looking for answers that you might have? Want a delicious citrus fragrant drink? Pick 5-10 of the large darker leaves from a lemon/lime tree and/or orange tree and break into bits and crush slightly with your hands. Boil in small pot of water for 5 minutes then let cool, strain and drink. For a milder taste or if you're in a hurry, simply pour boiling water over the broken and crushed leaves and steep for a minute or so before straining and drinking. Natural used kitty litter can be used as a deterrent for some of the larger garden pests, supposedly even deer, but especially rabbits. It apparently works at least for some weeks and if you've still got some determined pests, alternate with other strong smelling deterrents like crushed lavender stems, garlic spray or oil, or chilli/pepper. Spread or trickle a layer of kitty litter around the garden edge, or plants you want to protect. Remember with kitty litter to remove solid matter and always wash hands thoroughly. If possible remove when usefulness is over and put in compost to degrade safely. Some of the cries for help I get by email are tragic. Well nearly, it's simply that the gardener has become swamped with problems (challenges really) and doesn't know where to start. So I say, like all things, start with one and then fix another and so on... Thus if you have rampant beetles, lacy leaves, gnawed stems, rotten plants — start somewhere. Go to Natural Pest Control, then follow the links to help you. Spray those beetles, pick off those slugs, put up some netting, make up and sprinkle on a fungicide... add some mulch. Just do it a bit at a time and keep up the maintenance from then on. Some things you just have to have! "All signed up and so excited. Wife and I didn't wait for end of freebie trial, we could see how perfect it was for us and we wanted to plan the whole year and convert another lawn area into production!" Several readers liked my last kale recipe, so here's another one. Tasty and crisp, they certainly get snatched from the bowl fast! Tear the leafy part off the ribs of each kale leaf. Don't break the leaves up more than you have to as they will dramatically shrink. If you've washed the leaves, pat as dry as possible with a towel. Put on oven tray and sprinkle with your choice of oil or fat and mix with your hands so leaves are all lightly coated. Bake at 135C degrees (275F) uncovered. Check after 10 minutes and season lightly with salt and pepper. Salting them now instead of at the beginning stops them from steaming and turning into soggy, chewy lumps. Bake another 5-15 minutes or until crisp and dry without burning. Note: Curry powder, chilli powder, coriander and other spices can be sprinkled over, but remember use all seasonings and oils sparingly because the leaves shrink.